In the menu item Pictures, we have published another slide show containing 80 crystallisation pictures of dried water drops. We used again the same high quality Swiss tap water, which has been structured and informed before (cf. Informed Water and Method). The images were taken on 2‘000 ml of structured tap water, mixed up with 2 ml of specifically informed water. We called the information used in this sample “Cell Light”. The pictures are enlarged 50 or 500 times. The images of entire dried water drops are followed by their enlargements, which deliver interesting insights. It might appear almost as if luminous tentacles were growing out of dark cellular bodies, connecting with surrounding matter, which is gaining light. A current study shows that homoeopathic complex remedies might have a specific influence on water, too. 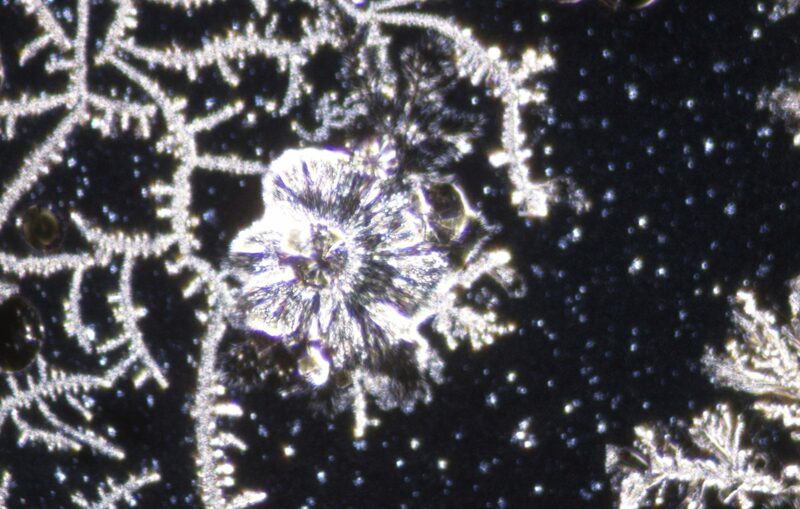 The first crystallisation pictures made of drops of structured water, which was informed with 4 different homoeopathic complex remedies, are quite impressive. The arrangement of the minerals in the water, the structures and the light seem to have clearly changed. The homoeopathic information was contained on a standard carrier of distilled water and alcohol. In the menu item Pictures, we have published a slide show containing 68 crystallisation pictures of dried water drops. The base consisted of high quality Swiss tap water which has been structured and informed before (cf. Informed Water and Method). The information was called “Heartiness”. The images ware taken of different samples, containing each a mixture of either 200 or 2’000 ml of structured tap water and 2 ml of specifically informed water. The crystallisation pictures show the deposits of the dried drops of these mixtures, magnified by the factor of 50, 200 or 500. Compared to the crystallisation pictures of pure tap water and structured tap water, the pictures of the informed water seem to display a higher degree of matter and luminosity. In the slide show, single water drops are followed by their enlargements. The highest enlargement factors do not only show more details but also more intense light and colours. Water – The great mistery, DVD, 2006. The structuring powers of water in organically raised food are impressively made visible by the Swiss A.W. Dänzer in his colour picture book with many dried drops of fruit and vegetables, enlarged 50 to 400 times. Prof.Dr. Gerald H. Pollack, University of Washington, was teaching bioengineering for 30 years. In his book he describes a new quality of the life element water, that hasn’t been known so far. During his experiments he discovered the fourth phase of water, which is absolutely clear water with a specific electrical load. One of his central conclusions: Water stores radiant energy, likewise a battery. This opens completely new perspectives in physics, chemistry, biology and medicine. A human being consists of about 80% water. Prof.Dr. Bernd Kröplin, former leader of the Institute of Statics and Dynamics of Aerospace Structures at the University of Stuttgart, was researching on the memory of water for 20 years. He uses pictures of drops to show the reaction of water due to external influences, its capacity to store information and to communicate over distances.